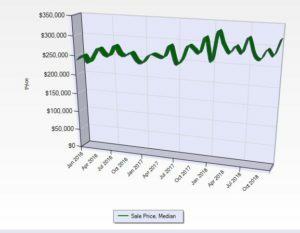 The number of weeks it takes to sell current inventory at present rate of sales is the absorption rate and is used as a way to track the “trend” of the market. The figures used here are per Big Bear Multiple Listing Service. What information from the MLS is needed for this Big Bear real estate market snapshot? Number that sold last month, 76 X 12 (months in a year) =912 divided by 52 (weeks in a year) =18.